The UbiSlate 7, the upgraded version of the Aakash tablet, is sold out for the month of January and February. DataWind is presently taking pre-orders for the month of March only. 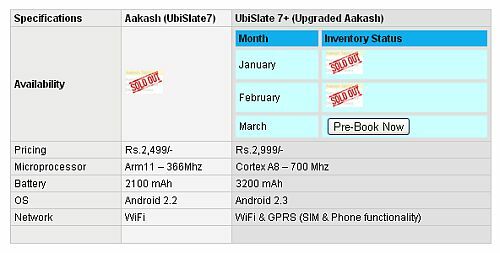 The pre-bookings for the UbiSlate 7 were opened last month along with online release of the Aakash tablet. 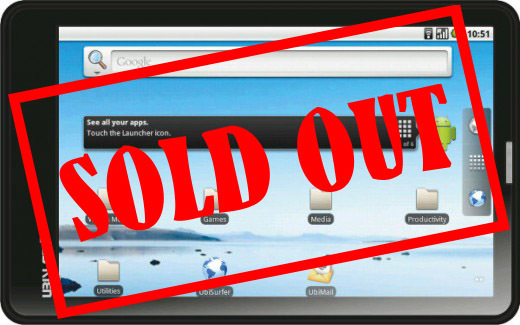 The Aakash tablet, also touted as the world's cheapest tablet PC, was sold out in less than a week after it was launched online. The UbiSlate 7 a.k.a Aakash 2 is said to be an upgraded version of the original Aakash tablet. The UbiSlate 7 runs on Android 2.3 Gingerbread operating system and is powered by a better Cortex A8 – 700 MHz processor. The tablet has a 3200 mAh battery. For connectivity, the UbiSlate 7 supports Wi-Fi and GPRS. Also, it has SIM and phone functionality. The UbiSlate 7 has been priced at Rs. 2,999. For more details about the UbiSlate 7 read, Skip Aakash and buy the Aakash 2 tablet for Rs. 500 more. Separately, DataWind has reportedly sold 14 lakh units of the Aakash tablet just two weeks after it was put up for sale online. DataWind is also planning to set up three new factories in Cochin, Hyderabad and Noida to cater what it calls as 'unexpected' demand. The online shopping site NCarry.com has also exhausted its stock of 30,000 units of the Aakash tablet. DataWind is likely to start delivery of the Aakash tablet in mid-January.